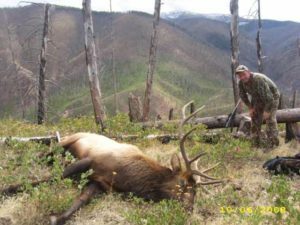 Our Montana elk hunts are run September Through November. Deer, Bear, Mountain Lion and Wolf can be hunted in combination on our elk hunts with the proper tags. 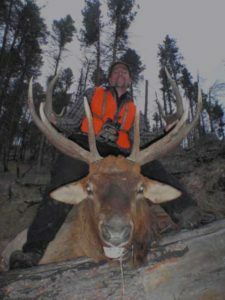 These Montana elk hunts are fair chase, spot, and stalk. Our all-inclusive elk hunts run eight nights with seven full days of hunting and include lodging and meals. Our day hunts start with a 3-day minimum you take care of your lodging and meals we provide lunch. Transportation to hunting areas are 4-wheel drive vehicles or horses, but most of the elk hunting will be on foot. License Application Deadline is March 15th. The units we hunt elk in are 204, 240, 250, 260, 261 and 270 On the Bitterroot National Forest and in the Selway-Bitterroot Wilderness. 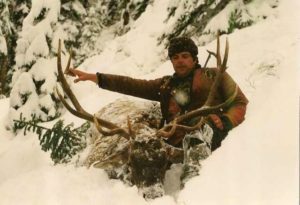 We offer day, motel and wilderness based elk hunts. Hunts are conducted out of Motels Cabins, or our home base three miles south of Hamilton Montana. Enjoy the comforts of home including hot showers and a warm bed along with home-cooked meals local fare from Hamiltons many fine eating establishments. Our Backcountry wilderness hunts are in the Bear Creek drainage of the Selway-Bitterroot Wilderness area unit 240. We invite you to “rough it” in style at our “home away from home.” We take pride in our camp where each canvas wall tent is fully equipped with padded cots, wood stoves, lanterns, and generally the finest in outdoor recreational comfort. Our meals are second to none as we serve hearty western meals; the finest the mountains have to offer.